Extended break for Streep after "Florence Foster Jenkins"? In a recent interview with the Phillipine Daily Inquirer, Meryl talked about several things, including her upcoming role as socialite Florence Foster Jenkins in the Stephen Frears biopic. Most interesting to me was that Streep was quoted as saying "I've been working non-stop for the last five years. So this Florence Foster Jenkins will be the last for a while." Of course it is not uncommon for Meryl to take extended breaks after a hectic schedule, at least in film. She went the entire years of 2000 and 2010 without making a single picture. It begs the question, however, whether Master Class will still happen despite the passing of Mike Nichols, who was attached to direct. Several sources had reported that filming was expected to begin as early as January 2015. Interestingly, I happened to notice that HBO's Emmy-winning film Recount was set to begin filming in the fall of 2007 with director Sydney Pollack, only for Pollack to withdraw just weeks before production due to illness. So there is clear precedent for directors being replaced at HBO. The two productions seem to be of very different scales however, as Recount had hundreds of cast members, and Master Class presumably has only around half a dozen. It may therefore be easier to forego continuing with the latter project. I also wonder exactly what Meryl means by "break." I recall her on the red carpet this past year for August: Osage County saying something similar, and like a month later she filmed Suffragette and signed on to star in Ricki and the Flash, which is currently underway. I know I'm beating a dead horse, but I continue to have hope that they'll pull The Good House together for a late 2015 filming schedule. You guys, I read the book and was fascinated by the possibility of Meryl portraying Hildy. Plus she'd be re-teamed with Robert De Niro. Make it happen, world. This 2015 schedule would possibly set Meryl up for several award nominations, most notably for Golden Globe noms in both Drama (Florence) and Comedy/Musical (Ricki) films, as well as in TV Movie/Minseries. All lead of course. I can't imagine anyone has ever been nominated in all three of those categories in one year. Greedy? Perhaps, but I want it to happen. Technically, I want both The Good House and The Senator's Wife to be released in 2016, but the only feasible way I can see that happen is if The Senator's Wife takes my suggested filming spot of The Good House in late 2015 and is released second half of 2016, and then The Good House is filmed early 2016 and is released later the same year. The pessimist in me predicts that Master Class, The Good House and The Senator's Wife will never get made, and Florence Foster Jenkins will be released late 2016. Hey, at least it'll give Meryl more spread out options for Oscar consideration. Plus, it provides fodder for my Reimagined History Part 5. President Obama awarded the Medal of Freedom, the highest civilian honor one can receive, to 19 individuals today. Meryl of course was one of them. He made a point of saying how much her "loved" her in a nice tribute. Yesterday turned out to be all about Into the Woods. A simulcast screening in New York and Burbank took place with a cast Q&A afterward, which Meryl attended. I was able to watch the livestream, and although it was rather short (under an hour), we got some good feedback from cast and filmmakers. Overall reaction from fans and members of the film/predictions industry has been favorable. Meryl in particular is getting a lot of very positive notices, as is Chris Pine who's been noted as a surprising scene stealer. It's impossible to get a good sense by just posting a few twitter reactions, but if you're interested in that, several can be seen on this IMDb thread. Official reviews have been embargoed by Disney until mid December. In addition to the screening, another film clip including Meryl was released yesterday. More great stuff. Finally, interviews with most of the cast and director Rob Marshall were released to You Tube yesterday, including some interesting B roll from filming. Below you'll see all three of Meryl's interviews. Enjoy! Although in limited release, The Homesman debuts today in the U.S. It's been picking up critical steam in the past couple of days as well, at the time of this post reaching 76% on Rotten Tomatoes with 43 reviews. And despite Meryl only having a bit part, I'm looking forward to seeing it. Hopefully you all do too. I'll leave you with an Academy Conversations interview Anne Thompson did the other night with Hilary Swank and director Tommy Lee Jones. The Hollywood Reporter has revealed that Stephen Frears' new biopic Florence Foster Jenkins (changed from simply Florence) has picked up multiple distributors worldwide. Pathé will distribute for the U.K., while several U.S distributors have evidently shown interest as well. Principle photography is set to begin in May, 2015. Obviously I will no longer consider this a "rumored" project. With Meryl finishing up Ricki and the Flash over the next month, she's likely going to transition relatively quickly into the role of Maria Callas for HBO's Master Class early in 2015. It begs the question that if Florence Foster Jenkins begins filming in May and possibly wraps by late June or early July, would they try to get it released by the end of 2015? No doubt on paper it will be an awards vehicle for Meryl, as were other Frears films like The Queen and Philomena for both Helen Mirren and Judi Dench, respectively. If we assume they have it ready by December 2015, Meryl will have both Ricki and Florence as contenders for the calendar year. Couple that with the likelihood of Master Class being shown by year's end (an enticing prospect of having Meryl portraying roles of both the most famous and infamous opera singers inside of a month) and we have a plethora of projects to look forward to over the next 13 months. I can't imagine Streep not in consideration for at least Globe nominations in all three! I'm still assuming Suffragette will be little more than a cameo. Knowing Florence will start in May, this seems to leave next fall open for filming. Will we finally see The Good House or even possibly The Senators' Wife (a film that if it were to happen I believe would be best marketed in 2016) come to fruition? As I've said countless times before, time will tell. I want both to happen! Keep that working cap on, Mary Louise. Yesterday, President Obama announced that Meryl will be one of 19 citizens honored with the Presidential Medal of Freedom. Wikipedia describes it as an award that "recognizes those individuals who have made an especially meritorious contribution to the security or national interests of the United States, world peace, cultural or other significant public or private endeavors." Wow. Quite the honor! 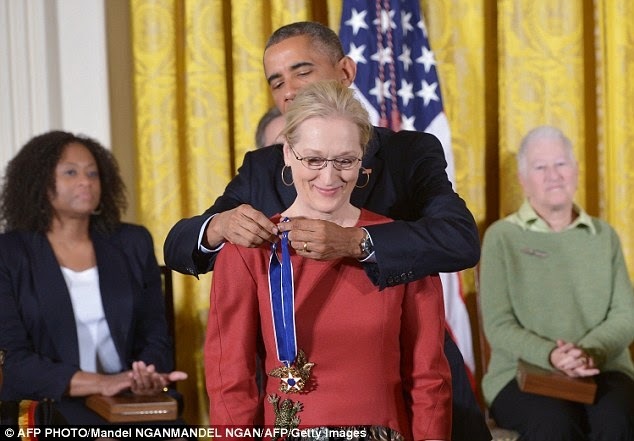 Streep has already been the recipient of the Kennedy Center Honors three years ago. Along with her film work, Meryl and her husband Don have been particularly philanthropic and are great benefactors of the arts. Congratulations, Meryl. The full list of recipients can be seen here. 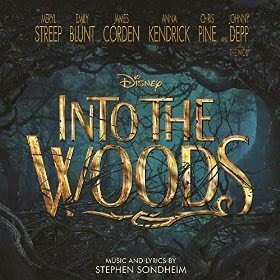 Film Music Reporter released an article today with the track listing for the upcoming soundtrack to Into the Woods. It appears that the deluxe version includes the instrumentals in between sung pieces. Just a quick little 30-second promo spot I noticed online today. Enjoy. Of course it looks stunning. And Meryl looks fierce post-transformation. The only real singing other than group stuff was Meryl singing "Stay with Me." She sounds lovely but (I can't believe I'm saying this) the last few notes "with me" sounded a bit...hard. Her voice is nicely light as the role requires, and I know I'm being really picky, but it's possibly my favorite note in the entire show. She doesn't use vibrato for that section and it comes across a bit amateur. It's my own fault for getting too attached to Bernadette Peters' version from the original production. I know Meryl is an actress first and singer second, but I was just hoping for that last little section to be more of what I was used to. Regardless, she sounds brilliant otherwise, and based on the trailer it looks like the film could really deliver. Moviefone has revealed new character posters for Into the Woods. In the article it's reported that a full and final trailer will be released tomorrow. If that's true, it seems my hunch about it happening before the weekend was correct. Can't wait! I love how it's actually a gif and not just a pic. In other, less exciting news, yesterday Meryl was nominated for her billionth People's Choice Award. Her nom is in the category Favorite Dramatic Movie Actress. The Giver was also nominated for Favorite Dramatic Movie, so I'm guessing Mery's recognition is for her role as the Chief Elder? Weird. The full list of nominees can be seen here. Full trailer for "Into the Woods" by this weekend? The teaser trailer for Into the Woods was released at the end of July. Since then we've all been patiently waiting for the full trailer. Our appetites were temporarily satiated a couple of weeks ago with the featurette Disney revealed which included some behind the scenes footage and (gasp) actual singing from cast members. Now that we're into November and the film is set for a wide release at the end of next month, a trailer has to happen soon, right? Disney's new animated film Big Hero 6 is set for release this Friday, November 7. I imagine this is the perfect opportunity to market Into the Woods by having a trailer precede Big Hero. If that's true, we may get the trailer revealed online as early as tomorrow or Thursday. Fingers crossed! p.s.- I've updated the film countdown for The Homesman on the right, as it's evidently going to hit theaters (limited) on Friday, November 14.